BRIAN CLOUGH was a very successful football manager. By turning two medium sized clubs in the East Midlands into football powerhouses he deserves his place in football history. Yet he was so much more than that... Clough's character and interaction with ordinary people, many of whom were not football fans, was unique. Whether it was helping old ladies with their shopping or giving them a lift home in his car or allowing young fans in to see their idols, Cloughie always seemed to have time for those around him. Many of the stories in 'The Fans Behind The Legend' speak of Brian's generosity and humility. His TV persona as an opinionated loudmouth may have antagonised some but his down to earth interactions with often awestruck fans is commonplace. In this heart-warming appreciation, he comes across as a man of the people, someone who is still very much missed and revered particularly in Derby and Nottingham and a man who continues to influence many of those who came into contact with him decades ago. Steve Brookes is a lifelong Aston Villa fan but has always been aware of the high esteem with which Brian Clough has been held. 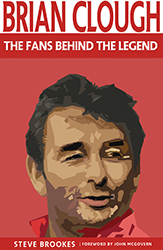 Of writing 'The Fans Behind The Legend' he says, "this book has been a fascinating project, speaking to so many Derby County and Nottingham Forest fans and a lot of neutral football supporters and even people with no interest in sport who shared the same admiration and respect for Brian Clough. "A lot of respect also must go to Peter Taylor, Brian’s assistant at Derby and Forest. Together they were the dream team! I hope you enjoy reading the book as much as I did making it, it's been an absolute pleasure hearing the many Cloughie stories in here."